BIG CYPRESS — Everyone can tell a Beletso basket, even without a blue, red or yellow prize ribbon hanging from its rim. For Linda Beletso and her daughters Lorraine Posada and Lenora Roberts, the distinction is a matter of family pride and personal artistry. With colors that mesh like music with each stitch of thread and every curve of sweetgrass coil, the baskets blend the marks of ancestor teachers and their own individual hands. 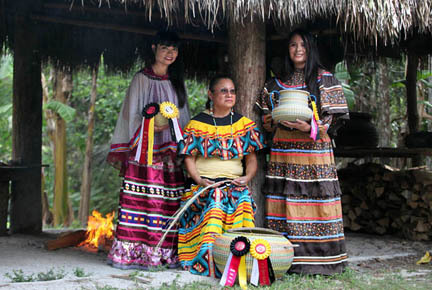 Having won high honors in the Tribe’s recent Tribal Fair and Brighton Field Day basket contests, Beletso and her daughters posed March 6 at Ah-Tah-Thi-Ki Museum’s Seminole village for a portrait before putting the award-winning pieces up for sale. “We try not to copy each other. We have our own little ways in our own little hands,” Beletso said amid the display flanked by beaded jewelry also handmade by the family. Beletso, trained in traditional basketry under Ethel Frank, Margaret Cypress and Linda Frank, said she creates “signature” baskets by pairing turquoise and red thread into ascending coils. Posada credited her mother for adding even more elaborate art elements to the otherwise functional vessels “just to be a little different.” Beletso uses embroidery thread to “paint” life, such as a grazing buffalo, onto the basket. “We each have our own technique,” Posada said. Posada started weaving at age 18. Roberts got her start in kindergarten. Beletso was surprised by both her daughters’ talents; in fact, she had no idea that Roberts had begun weaving long before her tiny fingers were ready for the intricate work. “My grass pile kept getting lower and lower. I wondered what was happening. Lenora was watching and I was teaching without even knowing,” Beletso said. Roberts prefers to use thinner coils and spiral stitches to fashion tighter vessels. She often punctuates her style with pastel-colored thread. One day, she surprised her mother with a small basket that she made perfect enough to show. “It had to be perfectly finished and good enough to show my mother,” Roberts said. Posada, who is right-handed, also learned from her mother, who is left-handed – which is why Posada is ambidextrous; at least when it comes to basketry. Posada’s touch incorporates complicated bead art, such as a diamond made of fire-colored glistening glass. The grazing buffalo and diamond-beaded baskets are on sale at the historic Smallwood Store on Chokoloskee Island. Other baskets are on display at administration offices tribalwide. Still others are owned by the rich and famous, including actor Kevin Costner and comedian George Lopez. Beletso and her daughters are at the Seminole village daily, weather and tribal events permitting, along with crafters Jeremiah Hall, Lorraine Cypress, Patsy Billie and Linda Frank. There, the group creates, displays and sells wood-carved items, beadworks, dolls and baskets. Basket prices are based primarily on the time it took to create. Each artist might have some idea of what they want the size to be, but the end result can never be planned. Sometimes one coil can take a full hour to thread. Buyers often ask the family to fashion identical baskets, but that is an impossible task. “We just never know how big or small the basket will be or what the basket will look like. It takes its own shape,” Posada said. “We just know that when it is finished, it is finished,” Beletso said. Tourist Sue Klopfer, of Clarkston, Michigan, who strolled the Museum grounds March 6 with her husband, Erwin, said watching the creation of art was “amazing.” They were most impressed with how the Tribe strengthens tradition and culture. “I read about the Seminoles and how they were forced out of Florida to Oklahoma, but being here and seeing how the survivors worked so hard to maintain a culture (we) tried so hard to destroy – that’s what I call tenacious,” Klopfer said. But Beletso, Posada and Roberts fear for the future of sweetgrass baskets because the wild land from where the sweetgrass grows and is harvested blade by blade is in danger of disappearing. Beletso said land development for homes and roads is good on one hand, but on the other hand, “what God has given us, man is destroying,” especially in Collier County near and in Immokalee, she said. Still, the family enjoys meeting daily under a chickee at the Seminole village to weave and bead. There, the smoke of a campfire and the touch of a breeze that whispers through towering banana trees give comfort. “It reminds me of when my grandmas had their camps. Susie Billie and Margaret Huff Dixie … (Margaret) cooked there on the fire every day until the day she passed,” Beletso said. Beletso almost quit making baskets when her daughters started to win. She said that was the plan, to give the younger girls a chance. But when she aged enough to become eligible to compete in the senior division, she had a change of heart. “I just love making baskets, and I just don’t think I’ll ever stop,” Beletso said.